This paper studies a kind of time-inconsistent linear–quadratic control problem in a more general framework with stochastic coefficients and random jumps. The time inconsistency comes from the dependence of the terminal cost on the current state as well as the presence of a quadratic term of the expected terminal state in the objective functional. Instead of finding a global optimal control, we look for a time-consistent locally optimal equilibrium solution within the class of open-loop controls. A general sufficient and necessary condition for equilibrium controls via a flow of forward–backward stochastic differential equations is derived. This paper further develops a new methodology to cope with the mathematical difficulties arising from the presence of stochastic coefficients and random jumps. 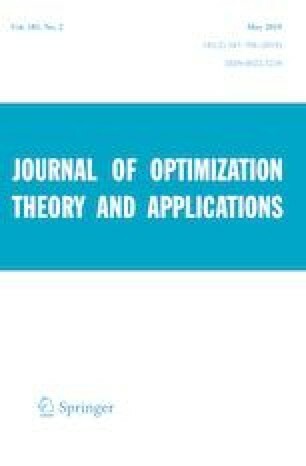 As an application, we study a mean-variance portfolio selection problem in a jump-diffusion financial market; an explicit equilibrium investment strategy in a deterministic coefficients case is obtained and proved to be unique. Communicated by Negash G. Medhin. The authors would like to thank the referees for their careful reading of the paper and helpful suggestions. This work was supported by the National Natural Science Foundation of China (NSFC Grant Nos. 11571189, 11701087, 61773411) and Shandong Provincial Natural Science Foundation, China. In this appendix, we provide an essential estimate assisting the proof of Proposition 3.2. To ease the explosion of the results, we only consider the case for \(n=1\), and the extension to the multidimensional case is straightforward. If not specified, we will denote by C some positive constants that may differ from line to line in the following estimates. where \(\xi (\cdot ;s)=(\xi _1(\cdot ;s),\ldots ,\xi _d(\cdot ;s))\) and \(\beta (\cdot ,\cdot ;s)=(\beta _1(\cdot ,\cdot ;s),\ldots ,\beta _m(\cdot ,\cdot ;s))\).